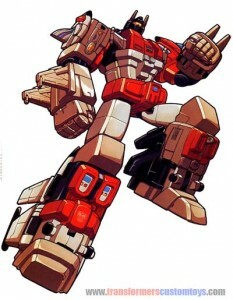 Profile: Superion is a fierce and frightful fighting machine. As the collective consciousness of the five Aerialbots, Air Raid, Skydive, Fireflight, Slingshot and Silverbolt, he might find it confusing and unproductive to assimilate each of his component personalities into one. Therefore, he suppresses much of what is potentially more than he can handle and directs his thinking to one primary purpose: the destruction of the Decepticons. And that’s about all he’s good for. Little else interests him; he’s unlikely to even engage in conversation about anything else. The other Autobots take this to be a cold and aloof attitude, as if Superion held himself above them. In truth, it is the most Superion can give of himself. Abilities: Superion can fly at speeds up to 800 mph. His range is 5800 miles. His strength is formidable; he can demolish a battleship with one blow. The stress fracture cannon he carries shoots a beam that locates and then overloads the natural fracture lines in any object it hits. The result can be anything from cracking open a peanut shell to causing a small earthquake. Weaknesses: Superion finds it diffcult to adapt to new situations and to be innovative. His thought processes are too primitive to allow for such higher mental functions. This often restricts him in battle. Although in-credibly strong and resistant to most artillery and beam weapons, he does have certain “pressure points” — areas of structural weakness where one component Aerialbot connects to the next—that are particularly vulnerable to attack.